Who broke the window? だれが窓を壊したのか. She broke the cup in two [into pieces]. 彼女は茶わんを真っ二つに割った[粉々に砕いた]. He broke a branch off [from the tree]. 彼は枝をもぎ取った[その木から枝を折った]. break one's leg [arm] 脚[腕]を折る. I've broken my watch again. また時計を壊してしまった. break a person's sleep 人の眠りを妨げる. A shot broke the morning calm . 銃声に朝の静けさが破られた. Only the whir of the air conditioner broke the silence in the office. 事務所の静けさを破るのはエアコンのブーンという音だけだった. break an electric circuit 電流を絶つ. break diplomatic relations with… …との外交関係を絶つ. 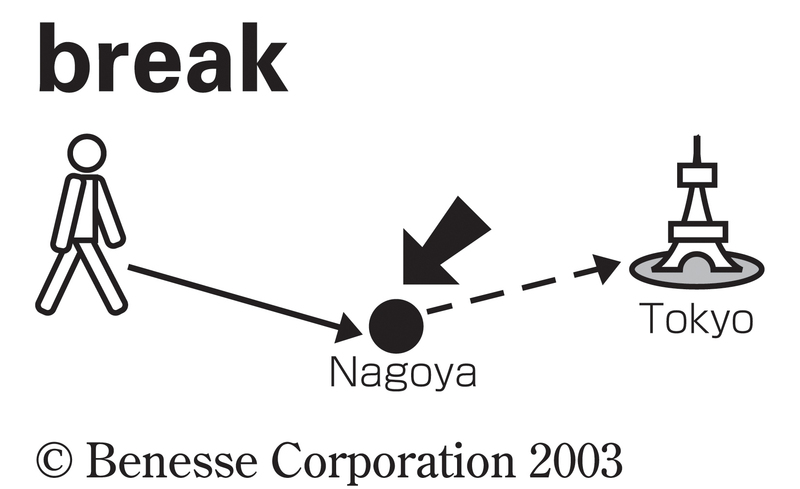 break one's journey (at …) (…で)途中下車する. He broke the conversation short. 彼ははたと話をやめた. break a trail [path] through the woods 森の中に小道を切り開く. break new [fresh] ground (研究・事業など)新分野に踏み出す, 新天地を切り開く. I saw a fish break the water of the pond. 一匹の魚が池の水面から飛び上がるのが見えた. break a crate (open) 木枠をあける. break a door open ドアをこじあける. break a set ひとそろいのものを分ける, ばらで売る. break a $100 bill 100ドル札をくずす. The revelation broke him. その暴露で彼は破滅した. The expense would break us. その経費では破産してしまうだろう. break one's promise [word] 約束を破る. She broke her date with me. 彼女は私とのデートの約束を破った. break a world record 世界記録を破る. break (off) the habit of smoking 喫煙の習慣を断つ. He broke his dog of the habit. 彼は犬のその癖を直した. He broke himself of his drinking habit. 彼は飲酒癖をやめた. break bounds 【陸海軍, 軍事】 (禁止区域へ)無断で脱出する. break a person's heart 悲嘆にくれさせる, 失恋させる. The heavy work will break your health. そんなに根つめて働いては体を壊しますよ. The trees break (the force of) the wind. その木で風がはばまれている. The dense bushes broke my fall from the ladder. 密生した茂みのおかげではしごから落ちても痛い目にあわなかった. Break the news to her gently. その知らせを彼女に穏やかに伝えてください. break a wild horse to the saddle 野生の馬を鞍(くら)にならす. break a secret code 秘密の暗号を解読する. The police broke the case. 警察は事件を解くかぎをつかんだ. The captain was broken for neglect of duty. 大尉は任務怠慢のかどで降等処分を受けた. The cup broke to [into] pieces. カップは粉々に砕けた. The TV has broken. テレビが壊れた. The handle has broken off. 取っ手が取れた. The surf broke on [over, against] the rocks. 寄せ波は岩に当たって砕け散った. 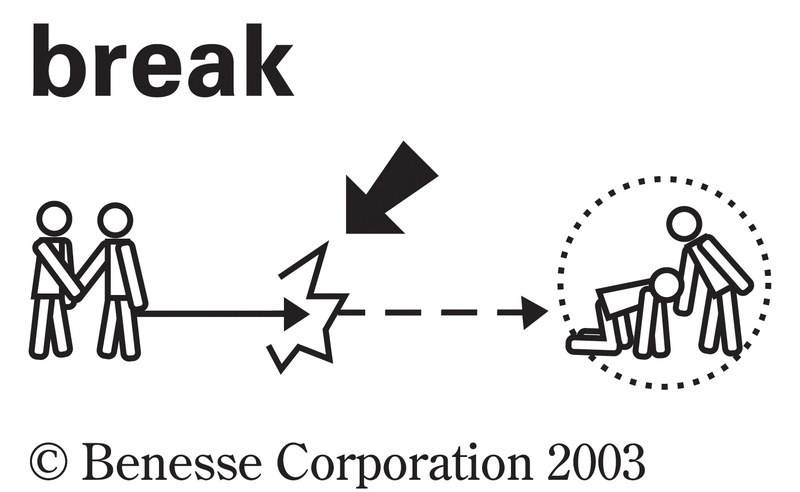 〔+補語〕[break open で] 破れて[砕けて]開く; ほどける. The box fell (to the floor) broke open. 箱は(床に)落ちてパッと開いた. The seam broke open at the shoulder. 肩の所で縫い目がほどけた. He broke under the strain of his responsibilities. 彼は重責を背負いこんで倒れてしまった. Her heart broke when her child died. 子供が息を引き取った時彼女はがっくりした. His health is beginning to break. 彼の健康は弱ってきている. The enemy broke and fled. 敵陣はくずれ敗走した. The clouds began to break. 雲間が出始めた. The spell of bad [good] weather broke. 天候が回復した[くずれた]. The storm broke soon. まもなくあらしが襲ってきた. A gasp [sob] broke from her. あえぐ[すすり泣く]音が彼女の口から聞こえてきた. A broad smile broke over his face. 彼は満面に笑みを浮かべた. Day was beginning to break. 夜が明けかけていた. The boy's voice has broken. 少年は声変わりした. break into tears [laughter] わっと泣き[どっと笑い]だす. He broke into a run. 彼は急に走りだした. The low rumble broke suddenly into a loud peal of thunder. 低い騒音が突然荒々しい雷鳴となってとどろきだした. We broke for tea. 仕事を中断してお茶にした (cf. tea break). School breaks for vacation on July 10th. 学校は 7 月 10 日から休みに入る. break with an old friend 旧友と絶交する. break with old habits 昔からの習慣を絶つ. break into a person's leisure 人のくつろいでいる所をじゃまをする. He broke into our conversation. 彼は私たちの話に割り込んできた. He broke out of jail. 彼は脱獄した. An artist must break free from the constraints of the past. 芸術家は過去の束縛から脱出しなければならない. The news [story] broke unexpectedly. そのニュース[話]は突然知れわたった. Things broke badly [well] for us. 事は(私たちにとって)うまくいかなかった[いった]. bréak ìnto… Bréak it úp! a break in the wall 壁のひび. a break in the clouds 雲の切れ間. Can't you get away during your lunch break? 昼(食)休みにちょっと出られませんか. My daughter is home for the Easter break. 娘はイースター休みで家に帰っている. a break in (a) conversation 話のとぎれ. without a break 絶え間なく, 続けざまに. They established diplomatic relations with the country after a break of twenty‐six years. 彼らはその国と 26 年ぶりに外交関係を確立した. a break in the weather 天候の変化. at (the) break of day 夜明けに. make a break with tradition 伝統と決別する. a break in one's career 生涯の変わり目. make a bad break ひどいへまをやらかす (cf. break 9a). a bad break 不運 (cf. break 8). The breaks are against me. ついていない. Give me a break. 頼むよ, 助けてくれよ. The sad news broke his heart. “Can you break a twenty? "“Sorry, I've only got hundreds." The riot police broke the human chain formed by the demonstrators. His proposal broke the deadlock in negotiations. He broke the bad news to her. No one has broken the secret code yet. They broke their journey to Tokyo at Nagoya. She broke her career to study abroad. The sound of the telephone ringing broke his concentration. The fuse broke the electric circuit. He broke his promise to help me. I'll try to break 5 minutes in the mile. Smoking is a very hard habit to break. They hid behind the trees to break the wind. The spell was broken when the princess kissed the frog. The old bridge broke under the weight of so many people. The dish broke into pieces. The Titanic broke in two before it sank. Waves break against the rocks. When the scandal broke, he realized that his political career was over. The child broke from my grasp. His curve ball is really breaking today. The rainy season finally broke. He broke under the strain. His voice broke shortly after he entered junior high school. Her voice broke as she told us the sad story. Things are breaking well for me. You had better stay in bed till your fever breaks. The child managed to break away from the kidnappers. She tried to break away from the old customs. The boys broke down the fence to get to the river. It took a long time to break down resistance to women voting. Dry ice breaks down into carbon and oxygen. She broke down her long speech into several components. His health broke down from the stress of his new job. At my grandmother's funeral I broke down and cried. He's breaking in his new car. I'm sorry to break in, but you have a phone call. I heard that someone broke into the bank last night. He rudely broke into our discussion with his stupid jokes. Let's break into those cookies. I am starving. She broke into tears . A lot of students want to break into computer programming. I broke my son of the habit of biting his nails. They broke off their conversation when he came in. Why did you break off relations with them? Right in the middle of her speech she broke off and ran out of the room. A fire broke out in the bowling alley last night. A plague broke out that killed thousands of people. Every summer I break out in a rash. Three convicts broke out of prison yesterday. I need to break out of this boring routine. It can take years to break through cultural barriers. I can't believe you broke up with your boyfriend. The police tried to break up the angry crowd. The peace conference broke up without making decisions. School breaks up on July 1st for the summer. Your joke really broke me up. He broke with his relatives. The water company came to fix a break in the water pipe. She's been depressed since the break with her boyfriend. Some students started talking during the break in the lecture. Some people get all the breaks. After years of unsuccessful auditions he desperately needed a break. The rope [cable, string] broke. My digital camera has broken. Waves break against[on] the rocks. The high-pressure system has broken up and moved out to sea. When the scandal broke he realized that his political career was over. A pisoner broke out of jail last night. His curveball is really breaking today. Her heart broke when he broke off the engagement. She broke into a smile when she saw them. He broke into a sweat after half a mile. His voice broke shortly after he entered high school. Things are breaking well [badly] for me. You had better stay in bed till your fever breaks . Mother broke the chocolate into four pieces. He decided to break the bad news to her. They broke their journey to Kyoto at Nagoya. She broke the backstroke record. The spell was broken when the the princess kissed the frog. Bosnia broke away from Yugoslabia. Our workers need time to break themselves in. I hate breaking in new shoes. He's out breaking in his new car. We put in new locks so no one can break in. She broke into a sweat [a smile, laughter, tears, a run]. I got hurt trying to break up a fight. He broke with his relatives, who were only after his money. We barely broke even in our first year of business. It's not easy to break the ice when the guests do not know each other. I broke my back getting here and no one seems to care. Writing this report is breaking my back. We've finally broken the back of this problem.. He broke his neck trying to impress the girls. A deer suddenly broke cover and disappeared into the woods. They broke ranks and voted with the opposition. ・The tag indicates where to break the line if needed. そのタグは, 必要なときにどこで行を切ればいいかを指示する. 【２】 中断する; 《デバッグのためプログラムを》 中断させる, ブレークする. ・The loop is broken when n becomes negative. n が負になるとループが中断される. 【１】 小休止; 中断; 《データ中の, 行やページなどの》 切れ目; ブレーク《プログラムの中断》. 【２】 破損, 破壊; 裂け目, 破損個所. To cause a routine, module, or program that had previously worked to cease working correctly. To interrupt execution at a given spot, usually for the purpose of debugging. From Middle English breken, from 古期英語 brecan (“to break”), from Proto-Germanic *brekaną (“to break”), from Proto-Indo-European *bʰreg- (“to break”). Cognates of Germanic origin include Scots brek (“to break”), West Frisian brekke (“to break”), Dutch breken (“to break”), Low German breken (“to break”), German brechen (“to break”), French broyer (“to crush, grind”), Gothic 𐌱𐍂𐌹𐌺𐌰𐌽 (brikan, “to break, destroy”), Norwegian brek (“desire, yearning”). Also cognate with Albanian brishtë (“fragile”), Latin frangō (“break, break up, shatter”, verb), whence English fracture and other terms – fragile, frail, fraction, and fragment. (transitive, intransitive) To separate into two or more pieces, to fracture or crack, by a process that cannot easily be reversed for reassembly. If the vase falls to the floor, it might break. In order to tend to the accident victim, he will break the window of the car. (transitive, intransitive) To crack or fracture (bone) under a physical strain. His ribs broke under the weight of the rocks piled on his chest. He slipped on the ice and broke his leg. (transitive) To divide (something, often money) into smaller units. Can you break a hundred-dollar bill for me? The wholesaler broke the container loads into palettes and boxes for local retailers. (transitive) To cause (a person または animal) to lose spirit or will; to crush the spirits of. Her child's death broke Angela. Interrogators have used many forms of torture to break prisoners of war. The interrogator hoped to break her to get her testimony against her accomplices. If I had called, and he had answered me; yet would I not believe that he had hearkened unto my voice. For he breaketh me with a tempest, and multiplieth my wounds without cause. To turn an animal into a beast of burden. Colonel: See, gentlemen? Any horse could be broken. (intransitive) To be crushed, or overwhelmed with sorrow or grief. (transitive) To interrupt; to destroy the continuity of; to dissolve or terminate. I had won four games in a row, but now you've broken my streak of luck. Go, release them, Ariel; / My charms I'll break, their senses I'll restore. With arts like these rich Matho, when he speaks, / Attracts all fees, and little lawyers breaks. (transitive) To violate, to not adhere to. When you go to Vancouver, promise me you won't break the law. He broke his vows by cheating on his wife. Time travel would break the laws of physics. Out, out, hyena! these are thy wonted arts […] / To break all faith, all vows, deceive, betray. (intransitive, of a fever) To pass the most dangerous part of the illness; to go down, in terms of temperature. (intransitive, of a spell of settled weather) To end. The forecast says the hot weather will break by midweek. (intransitive, of a storm) To begin; to end. We ran to find shelter before the storm broke. Around midday the storm broke, and the afternoon was calm and sunny. (intransitive, of morning, dawn, day etc.) To arrive. The day broke crisp and clear. The day begins to break, and night is fled. (transitive, gaming slang) To render (a game) unchallenging by altering its rules or exploiting loopholes or weaknesses in them in a way that gives a player an unfair advantage. Changing the rules to let white have three extra queens would break chess. I broke the RPG by training every member of my party to cast fireballs as well as use swords. (transitive, intransitive) To stop, or to cause to stop, functioning properly or altogether. On the hottest day of the year the refrigerator broke. Did you two break the trolley by racing with it? (specifically, in programming) To cause (some feature of a program または piece of software) to stop functioning properly; to cause a regression. Adding 64-bit support broke backward compatibility with earlier versions. (transitive) To cause (a barrier) to no longer bar. 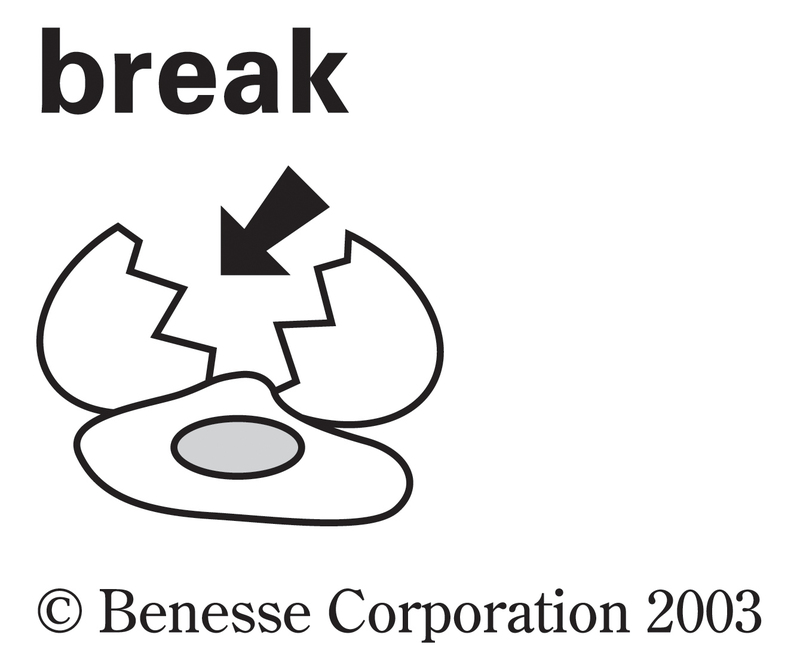 (specifically) To cause the shell of (an egg) to crack, so that the inside (yolk) is accessible. (specifically) To open (a safe) without using the correct key, combination, or the like. (transitive) To destroy the arrangement of; to throw into disorder; to pierce. The cavalry were not able to break the British squares. (intransitive, of a wave of water) To collapse into surf, after arriving in shallow water. (intransitive) To burst forth; to make its way; to come into view. The clouds are still above; and, while I speak, / A second deluge o'er our head may break. And from the turf a fountain broke, / And gurgled at our feet. (intransitive) To interrupt or cease one's work or occupation temporarily. (transitive) To interrupt (a fall) by inserting something so that the falling object does not (immediately) hit something else beneath. (transitive, ergative) To disclose or make known an item of news, etc. The newsman wanted to break a big story, something that would make him famous. I don't know how to break this to you, but your cat is not coming back. (intransitive, of a sound) To become audible suddenly. Like the crash of thunderbolts […] , the sound of musquetry broke over the lawn, […] . (transitive) To change a steady state abruptly. His coughing broke the silence. His turning on the lights broke the enchantment. With the mood broken, what we had been doing seemed pretty silly. (copulative, informal) To suddenly become. Things began breaking bad for him when his parents died. The arrest was standard, when suddenly the suspect broke ugly. (intransitive) Of a male voice, to become deeper at puberty. (intransitive) Of a voice, to alter in type due to emotion or strain: in men generally to go up, in women sometimes to go down; to crack. (transitive) To surpass or do better than (a specific number), to do better than (a record), setting a new record. He broke the men's 100-meter record. I can't believe she broke 3 under par! The policeman broke sixty on a residential street in his hurry to catch the thief. (transitive, tennis) To win a game (against one's opponent) as receiver. He needs to break serve to win the match. (intransitive, billiards, snooker, pool) To make the first shot; to scatter the balls from the initial neat arrangement. Is it your or my turn to break? (transitive, backgammon) To remove one of the two men on (a point). (transitive, military, most often in the passive tense) To demote, to reduce the military rank of. And he played no favorites: when his son-in-law sacked a city he had been told to spare, Genghis broke him to private. One morning after the budget had failed to balance Finanzminister von Scholz picked up Der Reichsanzeiger and found he had been broken to sergeant. Not long after this event, Clausen became involved in another disciplinary situation and was broken to private—the only one to win the Medal of Honor in Vietnam. (transitive) To end (a connection), to disconnect. The referee ordered the boxers to break the clinch. The referee broke the boxers' clinch. I couldn't hear a thing he was saying, so I broke the connection and called him back. (intransitive, of an emulsion) To demulsify. Conversely, as the emulsion breaks and the system returns to the original state, energy is released. When the droplets hit a solid wall the emulsion breaks instantly forming a bitumen on the wall and thus a layer up to 1 cm thick can be sprayed in one operation without requiring drying in between. The Baggies almost hit back instantly when Graham Dorrans broke from midfield and pulled the trigger from 15 yards but Paul Robinson did superbly to tip the Scot's drive around the post. (transitive, obsolete) To lay open, as a purpose; to disclose, divulge, or communicate. Katharine, break thy mind to me. (intransitive) To become weakened in constitution or faculties; to lose health or strength. See how the dean begins to break; / Poor gentleman he droops apace. (intransitive, obsolete) To fail in business; to become bankrupt. He that puts all upon adventures doth oftentimes break, and come to poverty. (transitive) To destroy the strength, firmness, or consistency of. (transitive) To destroy the official character and standing of; to cashier; to dismiss. I see a great officer broken. (intransitive) To make an abrupt or sudden change; to change the gait. (intransitive, archaic) To fall out; to terminate friendship. To break upon the score of danger or expense is to be mean and narrow-spirited. 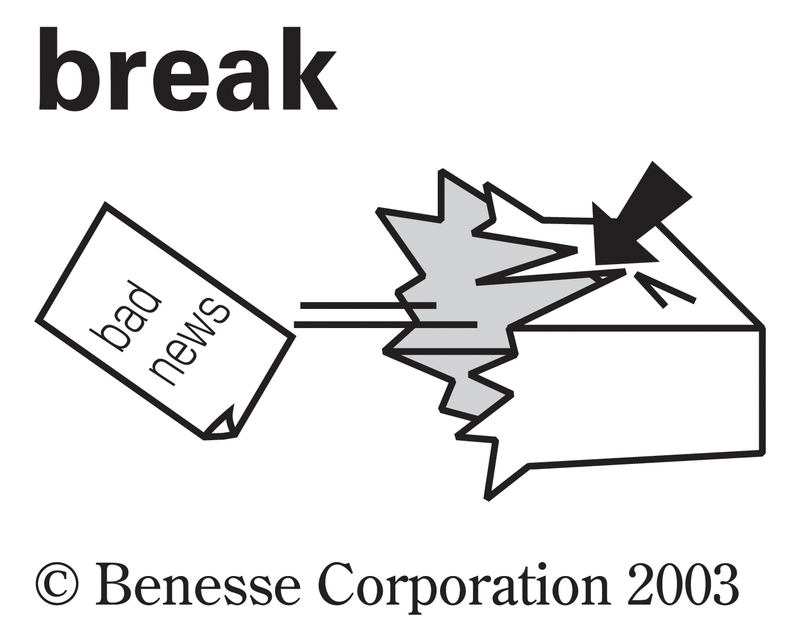 For quotations of use of this term, see Citations:break. 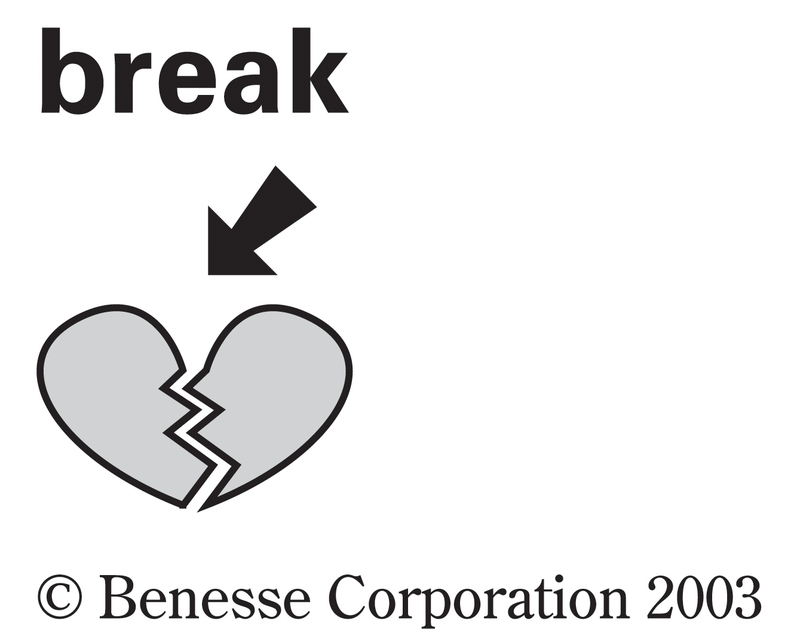 An instance of breaking something into two or more pieces. The sun came out in a break in the clouds. He waited minutes for a break in the traffic to cross the highway. A rest or pause, usually from work. (Britain) a time for students to talk or play. A temporary split with a romantic partner. A significant change in circumstance, attitude, perception, or focus of attention. (computing) The separation between lines or paragraphs of a written text. (Britain, weather) A change, particularly the end of a spell of persistent good or bad weather. (tennis) A game won by the receiving player(s). Blackpool were not without their opportunities - thanks to their willingness to commit and leave men forward even when under severe pressure - and they looked very capable of scoring on the break. (surfing) A place where waves break (that is, where waves pitch または spill forward creating white water). (dated) A large four-wheeled carriage, having a straight body and calash top, with the driver's seat in front and the footman's behind. (equitation) A sharp bit or snaffle. Pampered jades […] which need nor break nor bit. (music) A short section of music, often between verses, in which some performers stop while others continue. The fiddle break was amazing; it was a pity the singer came back in on the wrong note. (music) The point in the musical scale at which a woodwind instrument is designed to overblow, that is, to move from its lower to its upper register. Crossing the break smoothly is one of the first lessons the young clarinettist needs to master. music The instruments that are named are the ones that carry on playing, for example a fiddle break implies that the fiddle is the most prominent instrument playing during the break. Clipping of breakdown (the percussion break of songs chosen by a DJ for use in hip-hop music) and see also breakdancing. (music) A section of extended repetition of the percussion break to a song, created by a hip-hop DJ as rhythmic dance music.